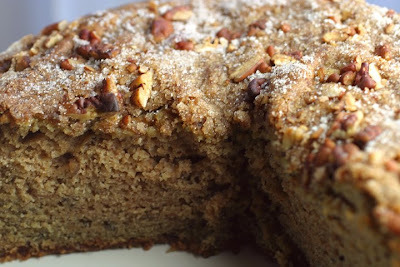 I found this delicious, tender and moist coffee cake on the back of a plum can label. I’ve rewritten the instructions for the food processor so it goes together in minutes. Instructions:Preheat oven to 350 degrees. Butter an 8 inch cake pan. Combine pecans, 1/4 cup sugar and cinnamon and stir together. Sprinkle half of this mixture into the bottom of the cake pan. Drain plums reserving juice. Pit plums and add enough juice back in to make one cup. In a food processor combine butter and 1 cup sugar until light and fluffy. Pulse in eggs until combined. Briefly pulse in plums and sour cream. Add baking powder, baking soda, and salt and pulse to incorporate. Add Flour and pulse until just mixed. Spoon the batter into the pan and sprinkle remaining cinnamon mixture over batter. Bake in preheated oven for 40 minutes or until inserted toothpick comes out clean. Start checking the cake around 35 minutes; it may take more or less time. Cool cake for 10 minutes. Loosen edges around cake with a butter knife and invert onto a serving plate. I'm thinking of trying to make your Plum Good Coffee Cake. I wanted to clarify . . . You say, "Spoon half the batter into pan. Sprinkle remaining cinnamon mixture over batter. Pour into cake pan." Do you mean the cinnamon mixture is layered between the batter, which is divided in half? Or, I assume the cinnamon mixture goes on top, but then why do you spoon HALF of the batter into the pan. Sorry, I am probably just reading this wrong. It sounds delicious. I can't wait to try making it. Sorry, this was my first post and I was learning how to do this. I clarified it a little for you. Spoon half of the crumble mixture onto the bottom of the pan, then all the batter, then the other half of the crumble mixture. I think you're the only person who ever looked this far down! Thanks.